Last week, we celebrated the 25th Anniversary of our network and our Annual Conference in Utrecht, The Netherlands. For the occasion, EPR members and partners gathered together during two days of sharing knowledge, practices and mutual learning seasoned with experts’ speeches on various topics such as entrepreneurship in rehabilitation, employment for people with disabilities or European policies for delivering quality and affordable services to people with disabilities. 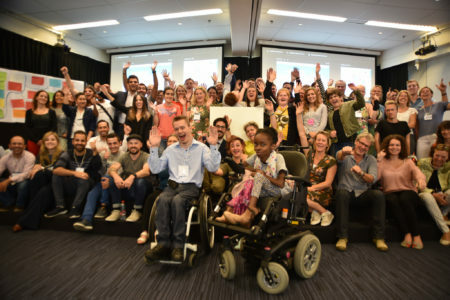 One of the flagships of our key annual event was the elaboration of a Manifesto by young people with and without disabilities working together to advance the inclusion of people with disabilities in line with the European Social Charter, guarantee of fundamental rights in Europe. This activity took place as part of the Erasmus + project ‘The future you(th) Want’ that our network coordinates together with other European organisations such as the European Network for Independent Living or the European Disability Forum and our national members. The celebration of our 25th Anniversary was marked by the speech of key personalities in the development of EPR such as the former President of our network, its current President and Secretary General. The two-day event finished with the emotional and motivating speech of Spanish Paralympic winner David Casinos. More information about our Conference will follow up shortly, including reports, presentations and pictures.